My second finished piece has been more fun than my first. I feel more of myself in this piece. I am finding my groove. 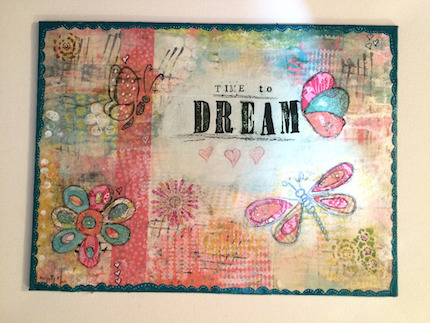 July 2015, I started a mixed media art course thinking nothing would come of it, just a bit of fun, I was very drawn to it and have been since I first heard of it a year ago. I was tempted then and even bought some basic supplies. Very close to a special birthday of mine Kelly Rae Roberts was having her own special birthday and put her course on sale. It took me a day, to have the courage to lean into this thing. Very happy I have, a great gift, new journey and possibilities. When learning from another artist you tend to take on some of their style, yet it is very important for me to find my own voice in my artwork. So creating from my whispers and not that of another artist is something I am developing. Thank you Kelly Rae Roberts for bringing me, perhaps, one of my most life changing possibilities. It is hard to explain how art making is becoming a basic need. 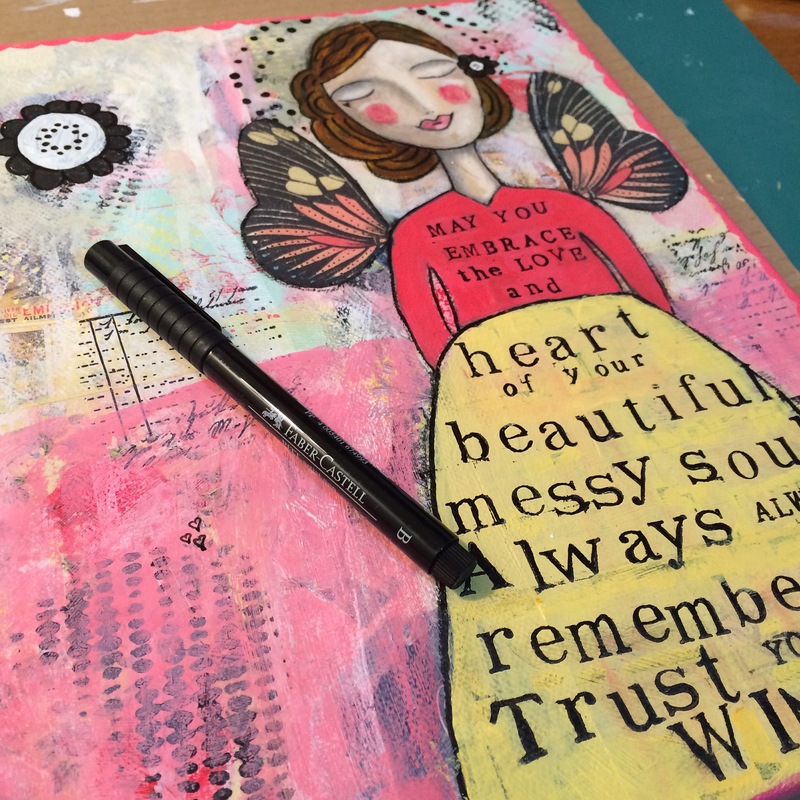 This course ‘Hello Soul, Hello Mantra’s’ taught more than just mixed media art techniques. ‘Time to Dream, close your eyes, listen for your whispers. They are waiting for you’. It seems every 7 years or so I go through a time of turmoil when my soul whispers to me louder than ever, or is it that I am listening harder. It is a confusing time, a time of struggle and a time of self doubt. I have a wonderful job which I love and feel very privileged to be in (an answer to past whispers). 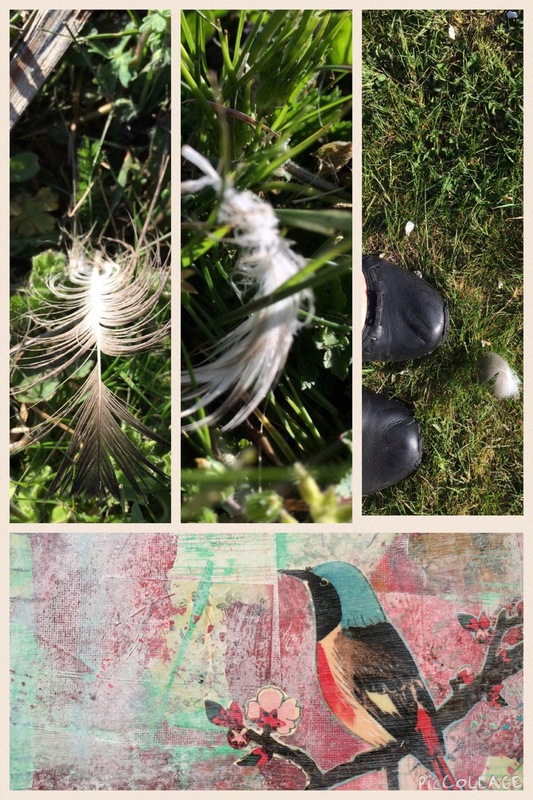 I love sewing crafts (no mending), stitching, quilting, making, creating and recently mixed media artworks. I could work in that space for hours and hours and come out the other side feeling satisfied, grateful and my soul fed. For me, this is important because I know what it feels like to have a fed soul. You are satisfied with your world, you are grateful, you jump out of bed in the morning feeling excited about what they day will bring, you no longer watch mindless television to dull the ache and you love where you are, who you are and feel a great sense of self worth and importance. Right now my soul is whispering to me ‘time to tell your messy, complicated, beautiful story’. So here I am trusting that whisper, that is so loud, if I don’t listen, it stops me from resting, writing, creating, eating healthy and being joyful. It is time for me to show up with courage and trust and ‘be brave with my life’. 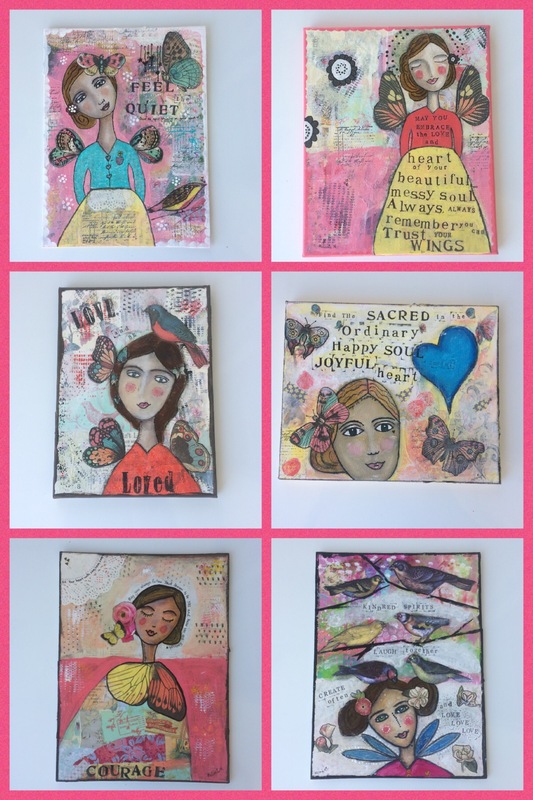 I have so much stuff to share – my journey into mixed media art – my progress in my wear your joy project – my journey as a writer. I can’t wait. What are your whispers saying to you? To listen just stop, be quiet, feel your place and space and find that niggle, that tug, that need – what is it saying. Listen to your whispers they are telling you what it is important for you to be you, your authentic truth. I would love to hear about them and you.